This is an important study, because it emphasises that this is a universal financial phenomenon, and not one merely confined to mortgage lenders that were encouraged by the Federal government into lending to risky mortgagees. The ability to securitise lending and so move the risk off your balance sheet leads to riskier lending, period. This exemplifies the problem with shadow finance. Without the incentive of failure for lenders who lend to those who cannot repay, standards become laxer, and the system begins to accrue junk loans that are shipped off the lenders’ balance sheets and onto someone else’s. This seems like no problem to the originating lender, who can amass profits quickly by throwing liquidity at dubious debtors who may not be able to repay without having to worry about whether the loan will be repaid. The trouble is that as the junk debt amasses, the entire system becomes endangered, as more and more counterparties’ balance sheets become clogged up with toxic junk lent by lenders with lax standards and rubber-stamped as Triple-A by corrupt or incompetent ratings agencies. As more laxly-vetted debtors default on their obligations, financial firms — and the wider financial system, including those issuers who first issued the junk debt and sold it to other counterparties — come under pressure. If enough debtors default, financial firms may become bankrupt, defaulting on their own obligations, and throwing the entire system into mass bankruptcy and meltdown. This “risk management” — that lowers lending standards, and spreads toxic debt throughout the system — actually concentrates and systematises risk. Daron Acemoglu produced a mathematical model consistent with this phenomenon. In a bailout-free environment, these kinds of practices would become severely discouraged by the fact that firms that practiced them and firms that engaged with those firms as counterparties would be bankrupted. The practice of making lax loans, and shipping the risk onto someone else’s balance sheet would be ended, either by severely tightened lending standards, or by the fact that the market for securitisation would be killed off. However, the Federal Reserve has stepped into the shadow securities market, acting as a buyer-of-last-resort. While this has certainly stabilised a financial system that post-2008 was undergoing the severest liquidity panic the world has probably ever seen, it has also created a huge moral hazard, backstopping a fundamentally perverse and unsustainable practice. But so long as the Federal Reserve continues to act as a buyer-of-last-resort for toxic junk securities produced by lax lending, the fundamentally risk-magnifying practices of lax lending and securitisation won’t go away. Having the Federal Reserve absorb the losses created by moral hazard is no cure for moral hazard, because it creates more moral hazard. This issue soon enough will rise to the surface again with predictably awful consequences, whether in another jurisdiction (China? ), or another market (securitised corporate debt? securitised student loan debt?). The Chancellor warned that “aggressively” breaking up banks would do little to benefit the UK and insisted the Government’s plans to put in place a so-called “ring fence” to force banks to isolate their riskier, investment banking businesses from their retail arm was the right way to make the financial system safer. His comments came as he gave evidence to the parliamentary commission on banking standards where he was accused of attempting to pressure members into supporting his ring-fencing reforms. “That work has been accepted, as far as I’m aware, by all the major political parties. We are now on the verge of getting on with it,” he said. Several members of the Commission have argued in favour of breaking up large banks, including former Chancellor, Lord Lawson. 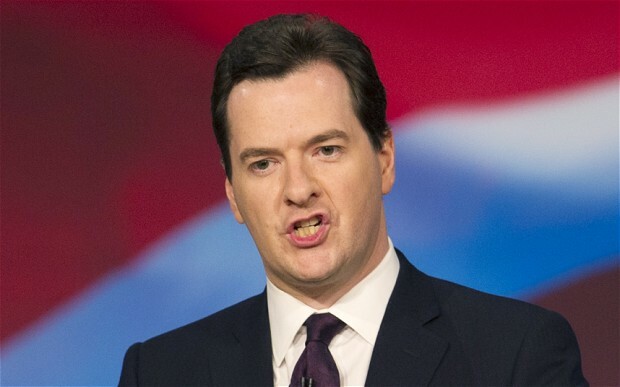 Why would Osborne want to see more of something which requires government bailouts to subsist? Because that is the reality of a large, interconnective banking system filled with large, powerful interconnected banks. The 2008 crisis illustrates the problem with a large interconnective banking system. Big banks develop large, diversified and interconnected balance sheets as a sort of shock absorber. Under ordinary circumstances, if a negative shock (say, the failure of a hedge fund) happens, and the losses incurred are shared throughout the system by multiple creditors, then those smaller losses can be more easily absorbed than if the losses were absorbed by a single creditor, who then may be forced to default to other creditors. However, in the case of a very large shock (say, the failure of a megabank like Lehman Brothers or — heaven forbid! — Goldman Sachs) an interconnective network can simply amplify the shock and set the entire system on fire. ers, not dampeners, as losses cascade. The system acts not as a mutual insurance device but as a mutual incendiary device. fined to where they originate. What this means (and what Osborne seems to miss) is that large banks are a systemic risk to a dense and interconnective financial system. Under a free market system (i.e. no bailouts) the brutal liquidation resulting from the crash of a too-big-to-fail megabank would serve as a warning sign. Large interconnective banks would be tarnished as a risky counterparty. The banking system would either have to self-regulate — prevent banks from getting too interconnected, and provide its own (non-taxpayer funded) liquidity insurance in the case of systemic risk — or accept the reality of large-scale liquidationary crashes. In the system we have (and the system Japan has lived with for the last twenty years) bailouts prevent liquidation, there are no real disincentives (after all capitalism without failure is like religion without sin — it doesn’t work), and the bailed-out too-big-to-fail banks become liquidity sucking zombies hooked on bailouts and injections.